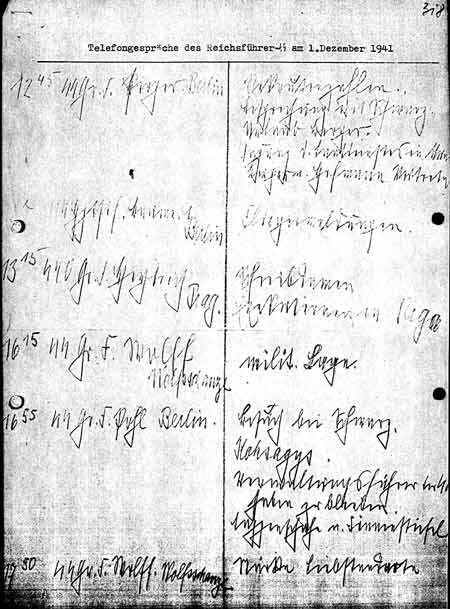 FOR the ludicrous debate in Court on the misreading of Heinrich Himmler's handwritten note of Dec 1, 1941, read and enjoy the Trial Transcript of Days 1, 3, 22, and 23. The error was inconsequential; as I pointed out to the Court, if the whole sentence was removed from the 1977 edition of Hitler's War it did not affect the paragraph 's meaning one whit. I gave copies of all the facsimiles and my typed transcripts to the Institut für Zeitgeschichte in the 1960s, even before the book was published -- hardly the work of a deliberate falisifier. In later editions the misreading was corrected. Help David Irving defend his career and reputation. It is a red-hot problem. Find out about to his fighting fund.